January 21st, 2016. In a special two hour Digimon World reunion stream, hosts X alongside guest speakers Aoi Eir, World producer Shindo Takayuki, planner Minowa Atsushi, and -next 0rder- producer Fujiwara Yasunori, introduced a new trailer for Digimon World -next 0rder-. 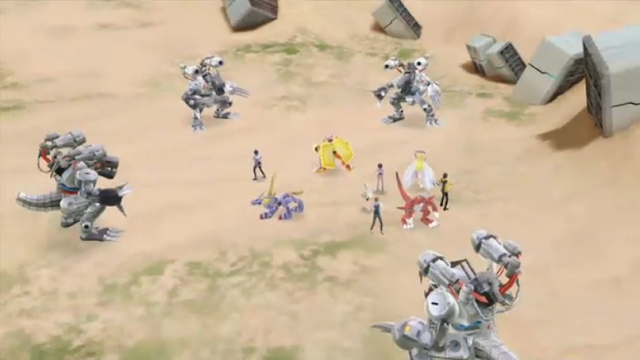 The preview video features protagonist Takuto and his friends facing down a squad of Mugendramon, and shows off various gameplay mechanics. The PV gives an etymology of the game's ExE-volution mechanic, "Extra Cross Evolution." "Welcome to the Digital World--or should I say, 'welcome back'?" The trailer features several gameplay mechanics described in the promotional materials released up to now, including camping, ExE-volution, and the 0rder System. An English subtitled version is being worked on, and several recordings from the stream are currently being processed. The stream was divided into two halves, with the first hour devoted to playing the original Digimon World along with its producers, and the second to playing -next 0rder-. This is the first real gameplay seen on camera; several mechanics previously leaked from first gameplay impressions at Jump Festa 2016 were seen in the stream, including the newly-introduced evolution hints the player gets when praising or scolding Digimon. 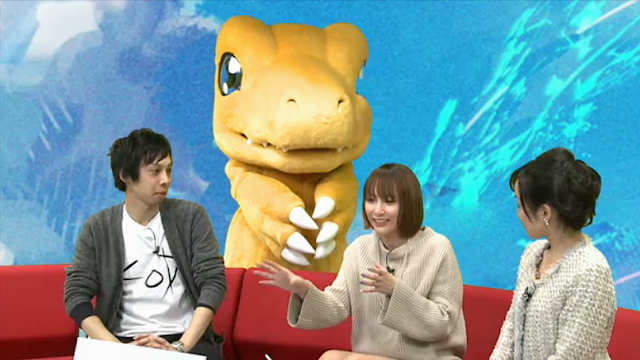 The stream ended with the Agumon mascot character asking Aoi Eir for her autograph, and an overview of various current and upcoming merchandise. A few hours prior, the -next 0rder- title site updated with special information; a new "Nade-Nade" (lit. "Rub-rub") campaign is beginning. Previously used to promote Digimon Adventure tri., Nade-Nade campaigns require fans to rub a Digitama, which will hatch into a Digimon with new announcements once it has passed a certain number of rubs. Originally this took the form of once-per-day clicking, but this newest campaign has players send out premade tweets and other social media posts to Nade-Nade. Instead of the new information bumps of previous campaigns, the new Nade-Nade rewards players of -next 0rder- and Digimon Linkz with in-game items for reaching certain thresholds. 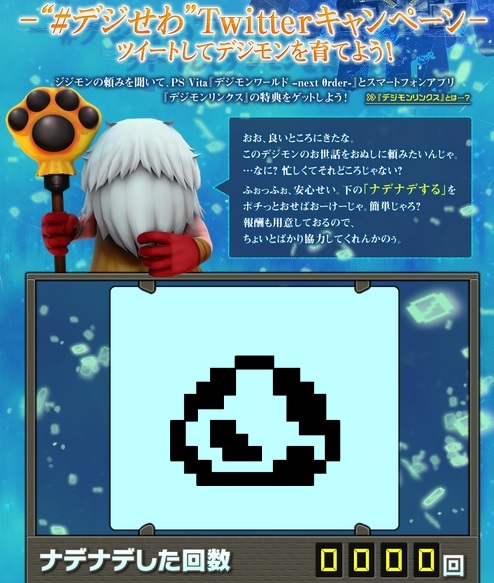 The first threshold rewards players with a Chain Melon (an item which extends a Digimon's lifespan) for -next 0rder-, and a Digistone for Linkz. In its original incarnation, Nade-Nade was easily the most despised aspect of Adventure tri. 's promotional campaign, as Bandai had been known to manipulate the results, introducing periodic freezes on the counter to prevent the Digitama from hatching too quickly, and introducing disproportionate multipliers (i.e., making every click count for 12, 20, or even 100 instead of 1) towards the end of a campaign to force the Digitama to hatch on a schedule while giving the illusion of fan participation. Past announcements have been effectively scheduled to come out on specific dates using these methods. What do you mean by that? I honestly prefer Story-games system, but this is not that bad. You see in the trailer that they give one food for 2 simultaneously, poop simultaneously, evolve simultaneously, and so on. I guess the exclusiveness per individual such as active time, hunger capacity, pooping time, etc are being removed completely for the sake of this new system. You will just feel weird if you raise an angewomon and a ladydevimon but they both sleep at night. Anw I will still buy it to prove whether it's right or not in the whole gameplay, but I will be more afraid for now. I believe they actually evolve seperately, otherwise wouldn't they share the same level? I'm disappointed with the 200 limit of Digimon considering how many recolours I recognized from the new trailer alone. Although, I do like some of them like GoldVdramon I just expected more. It's not exactly a 200 "limit," but rather a 200 baseline. It seems like the same situation as Cyber Sleuth, the advertising is lowballing compared to the actual number available in the game. Although considering that the game will likely have a medal system to raise tamer level like the original World game, and one of those will probably be a medal for raising every Digimon, on the flipside having *too* many would be overwhelming. Working on it. I have like 20 minutes of other video to go through as well, because of the first gameplay clips. I'm also a bit disappointed with the number of recolours in the game u.u Anyway, how many Digimon have been confirmed so far? subspecies existences has always been awesome in digimon game, it means they're not forgotten. I'm happy to see Waruseadramon, though. It's almost forgotten in recent digimon media. The game's already introducing the Executor Omegamon variant, and Maicoomon's going to be in the game. We don't really need any new Digimon.